There are times when the location of a tree will require the use of a crane to aid removal. In this situation, Porter Tree Services is prepared to safely and professionally remove your tree with our crane service. We offer crane services to residential and commercial customers throughout the area. In some cases, tree branches that must be removed cannot be safely dropped or lowered to the ground due to the location of buildings or personal property. In this instance, our crane can navigate around buildings or personal property and ensure that no damage is caused to surrounding structures. The tree branches and trunk are secured to cables and lifted away before being lowered to the ground in a safe area. Once the trees and branches have been safely cut down and moved to a secure area, we will cut the wood into smaller pieces for removal. All remaining debris will be removed ensuring that the area is restored to its natural state. Our crane services for tree removal are available for home owners and business owners alike, and we are happy to schedule the service when it is convenient for you. The crews that operate the machinery have years of experience and can communicate effectively and work with other contractors, if they should also be on site. At Porter Tree Services we take pride in every aspect of tree removal and maintenance. Our employees are trained to communicate effectively and respond professionally to our clients ensuring the best customer service possible. 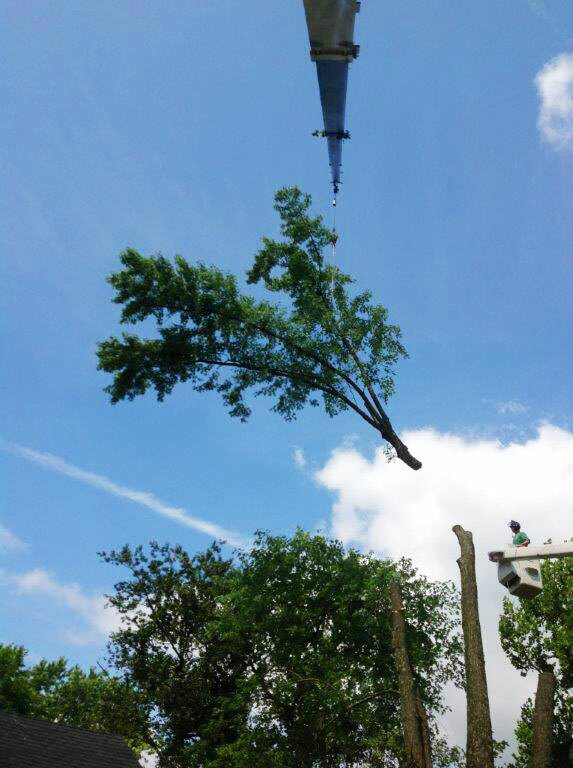 If your tree removal requires crane service, contact us today. We will meet with you on site to determine the scope of the project, and answer all of your questions. Call 410-882-TREE (8733).